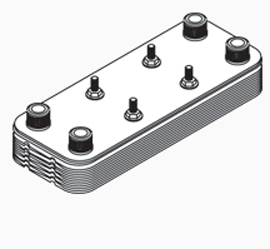 The Plate Heat Exchanger is a compact, high-performance, water-to-water, continuous flow heat exchanger with MPT ports. Units are 316L stainless, copper-brazed. Typical application: water heaters. 5x12-6, 3/4" port.